Five tracks, almost sixty minutes of a music to cut the breath, Reverie is a jewel post-rock/ambient/metal which gives its noble letters to a kind swarming with groups to the more or less unequal talents, sometimes décriés, sometimes révérés. But as of " Ghost track" and its twelve minutes thirty of a symphony post-rock'n'roll mixing with an infinite delicacy, ethereal harmonies of a lunar poetry intimist with the telluric fractures of a heavy rock'n'roll which seems to become aware of its cracks, of its deep scars not to more seek but to seize our psychée. Passing in a few seconds of infinite contemplative softness to an emotional tsunami which submerges us of these crescendo tempestuous, Daturah delivers a work of a rare intensity where vague the post-rock'n'roll break on us with the installed capacity of despair. Moments of grace purified which fly over the ocean, before there replonger, exploring its instrumental reefs rocked by melodies enivrantes. No moment regrets one the absence of song, so much the music of German perspires the emotion in a wild state. 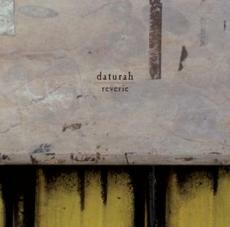 In formats ambient/post-rock'n'roll rather close to those of Mogwai, Mono or Explosions in the Sky, Daturah manages to push back the limits of the kind. until seizing quintessence of it. Seldom one will have been disturbed as much by a work which however asserts fully its classicism. Like what, it is sometimes useless to seek the originality with excess to be confined of a masterpiece. Heavy, powerful, envoûtant, majestic, superlatives are entrechoquent while at the same time the feelings enter in collision, the group delivering an eminently sensory and organic daydream to the disconcerting beauty. More directed ambient/rock'n'roll, rocked by spoken Word inhabited but which can be put perfectly in withdrawal when the guitars make speak the decibels, "Hybrisma" the travel in the entrails of the Earth continues. Initiatory, it reveals the gasoline of a music to the thousand possibilities, the epic harmonies and eruptive crescendo learnedly orchestrated. " 9" and its envoûtantes phantasmagoric beaches wrapping of the oneiric panoramas with wish, as if the fairies which gave birth Sigur Ros were a time leaning on its cradle, Daturah shows us that it definitely does not seem to know any limit. Watching for the horizon while creating, part after part, the electric mechanics of its large eight musical ("Deep B flat"), the German formation delivers an invaluable and felted disc. One then closes the eyes, eager to be let carry. Taken in a true emotional hurricane ("Vertex"), one is delicately plunged by the group in an artificial musical coma, before being grabbed by the orchestral gusts of wind of final extatique with the irrational power. Five titles, five jewels, five musical parts of goldsmithery which once enchêvetrées the ones with the others compose the chief of work which is Reverie. To discover, listen, feel. oui mais c'est un putain de bon disque!